Cars are about emotion, they are all about how they make us feel. This is why they come in so many shapes, sizes, and flavors. Otherwise, they’d be monochromatic boxes or bubbles, oriented merely towards transportation. The emotions surrounding cars get heightened when we see something we’d like to own and picture ourselves behind the wheel. Sometimes we get carried away, making purchasing decisions without sufficient relevant information. Getting a vehicle you’re interested in inspected by experienced professionals before you buy it can prevent the possible downside of impulsive action. 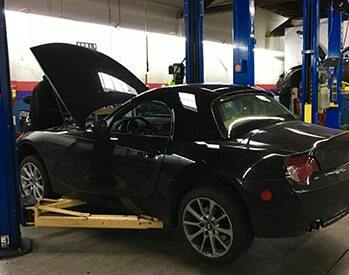 The Pre Purchase Inspection process here at Pacific Motorsports incorporates our decades of experience, the extensive experience of our factory-trained Master Technicians, and our conservative best practices approach. Starting with the factory BMW or MINI inspection regime used to qualify vehicles for the certified pre-owned sales program, we inspect at least 104 different points on the car, depending on the equipment and options present. The exterior is reviewed for leaks and damage, systems are actuated (e.g., wipers, ventilation, windows, etc. ), a road test is performed, diagnostic checks utilizing the factory computer of electric and electronic codes are run, and the vehicle is hoisted, underbody covers are removed and a thorough inspection of the undercarriage is conducted. This work takes us 2-4 hours to perform depending on the specific vehicle and requires an advance appointment so that it may be scheduled with one of our three factory trained Level 1 Master Technicians (BMW and MINI’s highest worldwide qualification). A thorough professional assessment of the vehicle’s current condition. A written and digital report with color photographs of the actual car, including detailed shots of any issues (not stock photos). Consultation to review these results. We’ve all heard used car buying horror stories, and some of us have even experienced them first hand. By getting a Pre Purchase Inspection before you buy your next car you’ll be less likely to “be that guy/gal”. *Please contact us for pre-2000 vehicle pricing & details.